Dogs can run. We can all agree on that. We have some dogs whose speeds clock in at 20, 25, and even 30 miles per hour! Remarkably we’ve clocked in other dog breeds at over 30 and even 40 mph! Here’s a short list of the top fastest dog breeds. Yes, there’s no doubt about this sleek and slender breed whose origin traces back to Eastern Europe’s ancient Celts. The greyhound’s likeness has even been found in Egyptian tombs! The greyhound is a bred racing dog with an impressive speed clocking in at 45 miles per hour! Besides racing, greyhounds have been used for hunting and chasing game. They also make great pets when they retire from racing and many greyhound adoption agencies can be found in virtually every location. Resembling the greyhound in both appearance and classification (both are in the sighthound group), the Saluki are bred for extreme endurance. They originate from Egypt and they can attain speeds of 40 mph. Some believe the Saluki can not only achieve the 40 mph mark but also sustain speed and distance longer than the greyhound! This 40 mph dog is a Hungarian import believed to date back to the 10th century. The Vizsla is a high energy dog and is considered a medium size breed. Its reddish-brown to copper-like appearance is quite attractive and its known for its protective instincts as well as its hunting skills. The Vizsla is easy to train and makes an excellent addition to an active family. The Afghan hound (a basal breed) is another dog with a running speed of up to 49 mph. Closely related to the Saluki, the Afghan was bred to withstand the cold and high mountain altitudes of Afghanistan. Every time someone mentions a Jack Russell I think of a jumping dog with an endless supply of energy! 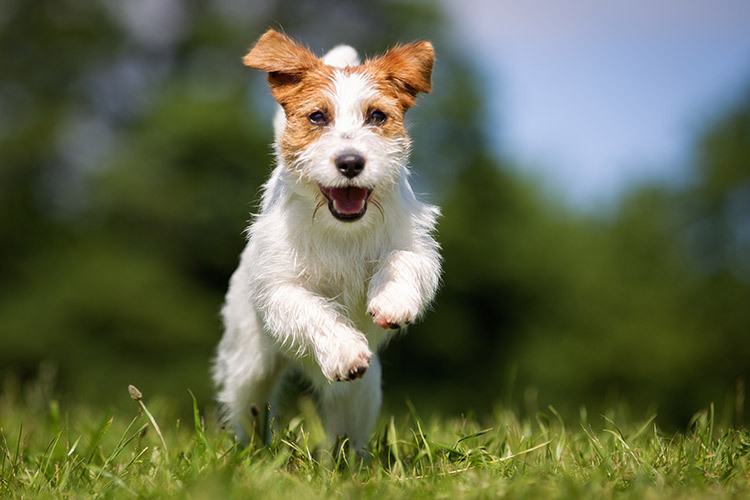 This small breed shouldn’t fool you, however, because the Jack Russell can reach an impressive speed of 38 mph. That’s a quick little critter! The Jack Russell can be traced back to 1795 England when hunters were in need of a white color dog breed to distinguish it from the game. Be prepared for a workout if you desire to own a Jack Russell. Originally bred as carriage dogs, Dalmatians can reach speeds of up to 37 mph! This breed is a favorite pet which is easily recognized by its black or brown spotted appearance. Throughout history Dalmatians were companion and guard dogs but, most of all, they are known as the firehouse dog (all 101 of them)! The Borzoi is crossbred specially to hunt wolves and is commonly known as the Russian Wolfhound. This breed is capable of reaching the 36 mph mark! The dog takes on the mixed appearance of a Saluki, Afghan hound, and Greyhound and as long as it has its daily run you don’t have to worry about it taking off and chasing wolves! Slightly slower than the Borzoi is the Weimaraner who clocks in at 35 mph. This is a dog bred primarily to hunt deer and wolves so if you want to own one, you’ll have to find some space for it to run and play. These sighthounds can run up to 35 mph and are used in racing and to hunt fast running prey. Some Whippets have reportedly reached speeds of 40 mph and are considered not only the fastest dog in the world for its size but also the fastest accelerating dog in the world! The breed resembles a small greyhound and was considered to be too small for hunting anything but rats. Nowadays the Whippet has become a favorite racing dog. Some dog breeds can run as fast as 30 mph. The Doberman Pinscher is one, as is the German Shepherd. Both make excellent guard dogs, war dogs, and dogs suited for police work. The Border Collie and the Poodle are two other canines that can run as fast as 30 mph. The Border Collie is extremely agile and is most commonly used as a farm and herding dog. The Poodle comes in three sizes: Toy, Miniature, and Standard. The Standard breed can reach the 30 mph mark and is easily recognized by its thick curled coat, dropped ears, and squarish build. Entering the pack at 28 mph are the Giant Schnauzer, the Scottish Deerhound, and the Italian Greyhound. The Giant Schnauzer’s origins can be traced to the Bavarian region of Germany. There, it was bred as a guard dog and livestock herder. The Schnauzer has a thick wiry coat which is either a solid black in color or a salt and pepper variation. The Scottish Deerhound looks like a wire haired greyhound and, as its name suggests, it was bred to hunt deer. Its standard color is grey to blue-grey. The Italian Greyhound is a small dog breed dating back to over 2,000 years ago to present day Greece and Turkey. This companion dog was adored in Italy for its miniature size. Many monarchs have owned Italian Greyhounds. The Italian greyhound has short, smooth coats and they’re known for their horse-like gaits. So there you have it – a list of the world’s fastest dog breeds (in our opinion)!